But environmental graphic design is nothing new. In fact, for perspective, the SEGD reminds us that environment signs can be dated back to cavemen sharing stories through paintings on the walls of their caves. And while the profession itself is only about 40 years old, its fundamental focus is on wayfinding as a means of improving – and subsequently shaping – a person’s experience of a place. Wayfinding is essential to any environment and its branding and is so much more than directional signage. Whenever someone enters an environment, they have to make immediate – and unfamiliar – decisions. So visual cues, such as maps, directions, and symbols, help guide people safely and securely. While identity says, ‘You are here,’ placemaking creates the experience. Once a visitor knows where they are – ‘here’ – graphic elements such as type, color, pattern, video and motion serve to shape the experience and identity of that place for every individual. Much like the caveman drawings of yore, exhibition design is nothing new. These designs tell stories through visuals as an integrative, multidisciplinary process that creates multi-layered narratives around a theme or topic. From museums to visitor centers, to parks, to expositions and retail stores, exhibition design is the intersection of physical space and visual storytelling. Using a vast array of materials and media, public installations can be art, memorials, gateways, landmarks, signage, super-scaled graphics, contextual elements, place-markers, and even branded corporate elements, lending their environments meaning, context and, often, an iconic optic. 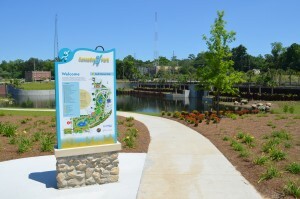 Boasting a twofold impact of both form and function, custom architectural signage and Environmental Graphic Design give visitors confidence while navigating unfamiliar terrain while telling the story of the community and environment. From bringing a brand and guest experience to life to enhancing urban landscapes, architectural signage and elements play a vital role in their environments. To learn more about how environmental graphic design and signage can improve your physical spaces, contact us at Creative Sign Designs today!